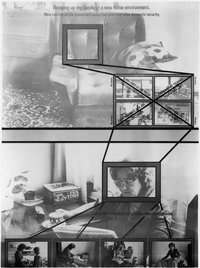 Single Parent Family was made with a family in Oxford during 1978 and was first shown in Willats’ exhibition, Living Within Contained Conditions, at the Museum of Modern Art in Oxford in 1978. This exhibition addressed issues of peoples’ lives in contemporary society. 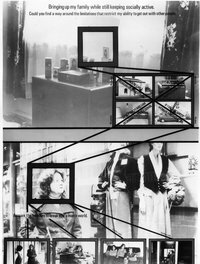 In order to present a contextual model of art about social issues that was relevant to a wider audience, Willats initiated several works with people living close to the Museum in Oxford. So that the exhibition contained works about people living locally on the Friars Wharf Estate which were shown within the Museum and people visiting the exhibition were to take part in a project that was concurrently taking place on the estate. Thus the realities of the artwork were shown existing outside the context of the Museum and the realities of life outside the Museum were transported directly into the gallery environment. The work focuses on the everyday problems of a single parent family, viewed through the perceptions of the widowed mother bringing up her children. Central to the work are the problems she encounters, striving to support her family and doing the best she can for her children. From the photographs and with direct quotes from the interviews, each panel describes the reality of three different situations the mother herself defined. 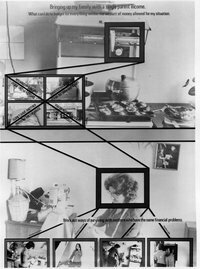 The direct questions to the viewer, and the range of possible responses and contexts in each panel, give the viewer a means of exploring her world and reviewing their own responses to the three different situations.